Hello all! With all the events running right now,is almost difficult to find something new,but then someone have a good idea and voilá! From ::EQ:: and his owner Titan Footman,the Assasin Mask,and I have to say I loved when he showed to me,but when I had the chance to appreciate better the texture and the detail of the mask,and the brows giving a look really evily to the piece,I just had to love it.I can just wish he will continue to work hard as he is doing right now and have soon more of his creations. 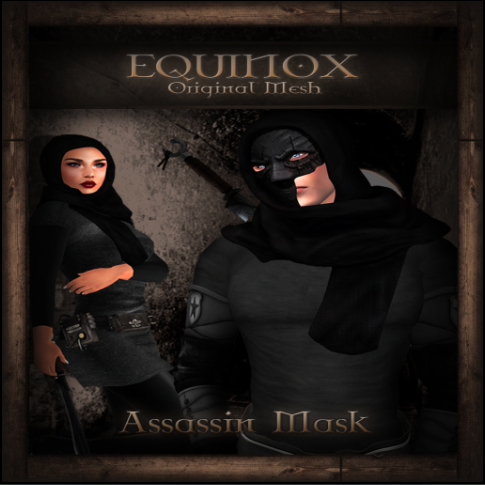 Mask and Hood – ::EQ:: Assassin Mask (Titan Footman) @ We ❤ Role-Play – SOON!! Poses – Mine again 😀 I will keep trying .